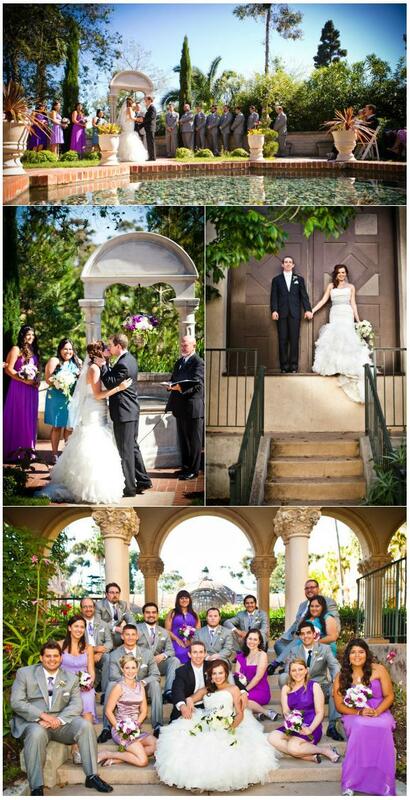 When Karen and Eddie came to me and said they were planning a wedding at the Prado, located in Balboa Park, a historic arts center in San Diego, CA, I was thrilled. I adore the Prado! I love the ballroom’s real hard wood floors, authentic wood stage, and decorative ceiling. Their ceremony by their wishing well and cocktails in the courtyard around a Spanish style fountain make the entire venue a wonderful place to get married. 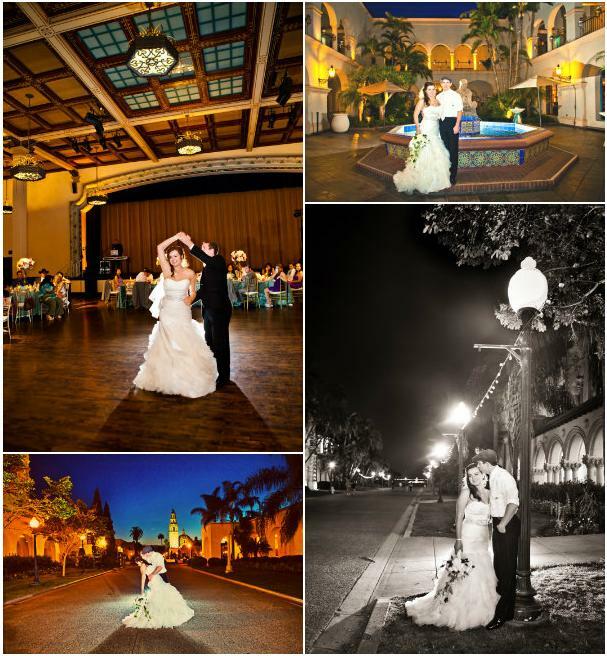 Plus, the photographic backdrops Balboa Park, in general, has to offer are perfect for creating amazing wedding day mementos. For colors, Karen told me she wanted to use lavender and peacock blue-green. She let her bridesmaids all choose their own lavender dresses and then Chris, of Indulge Flowers, created beautiful lavender and white bouquets to compliment them. We also decided that the gentlemen should have real lavender in their boutenierres–for color and for aroma! Both Eddie and Karen love the lavender plant, itself, and really wanted real lavender woven into their floral arrangements. For the ceremony, Chris created a simple bucket of overflowing purple and white flowers in a variety of tones and hung it from the wishing well. For the cocktail hour, we decided to put together a hanging screen of seating cards in purple, lavender, and peacock colors as our focal point. Chris made the screens out of old window frames and burlap and it looked amazing! Chris added buckets of lavender flowers at the base of the screen for more color and texture. For the reception, Karen fell in love with a blue-green swirl linen from La Tavola linens but to outfit all of her tables in that linen would have been out of her budget. We decided to therefore use it on the head table, cocktail table, and a few additional accent tables (ceremony welcome table and cocktail hour photo display table) and then use a much less expensive linen, in the same tone, on the rest of the tables. Karen literally saved $100’s of dollars by making this choice and the look was gorgeous. La Tavola carries a basic line of linens that are still made of a really nice, solid material and comes in a ton of colors. I just found one that matched the swirl linen best and we were in business. Chris then topped the tables with beautiful blue-green and gold candelabras with a mixture of white, purple, and lavender tones for a stunning look. Finally, we added the Prado’s gold chivari chairs, gold chargers, and pin spot lights on all the tables and the room was breathtaking. 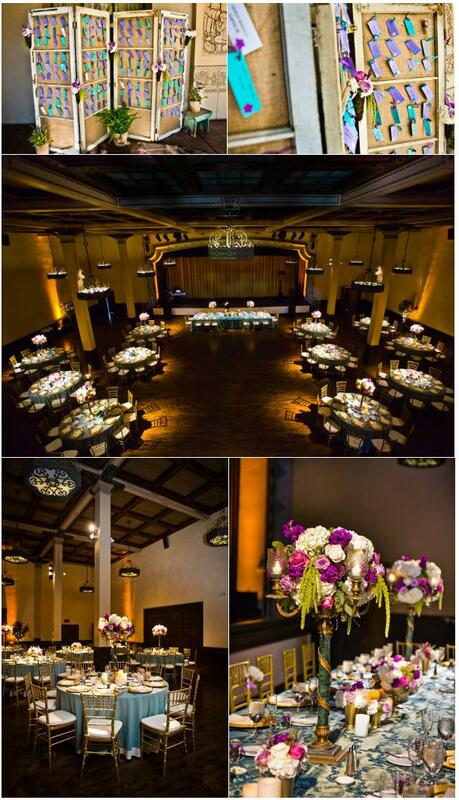 I am a huge fan of well-placed lighting and personally prefer pin-spots over uplighting along the perimeter. I love how pin spots make the tables and centerpieces glow. 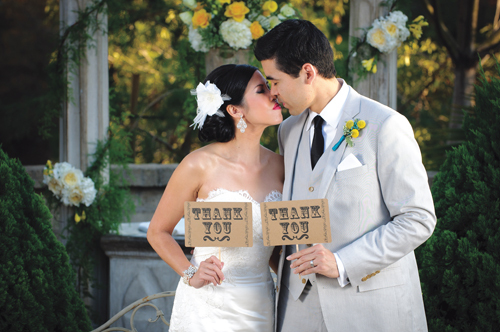 Eddie and Karen didn’t have a huge budget but by making a few good choices, they were able to create the wedding of their dreams. They chose to get married on a Friday which gave them a smaller food and beverage minimum (but at the venue they truly wanted), they chose to host most of the alcohol but not all of it, and they were open about their budget with me so that I could guide them and do research for them to ensure we stayed within it. And for me, they chose to book me for month of services plus hourly consultation along the way–which is a great way to get a full service type package on a smaller budget. 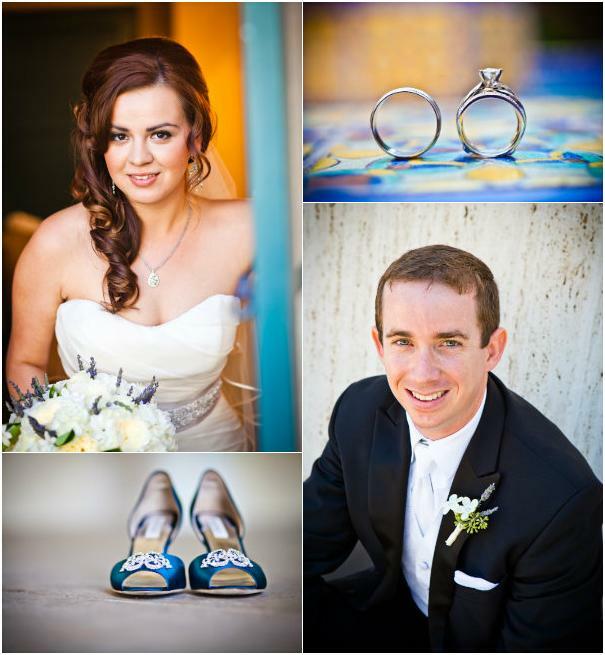 And I was definitely happy to assist them in creating such a gorgeous wedding with what they wanted to spend. And to top it off, I don’t think there could be two nicer people than Karen and Eddie. It was such a pleasure to work with them! Special thanks to Eddie Garcia of E3 photography for the great photos!